Beautifully display 270 bottles of polish and store your overstock in this attractive new stand by Deshi. 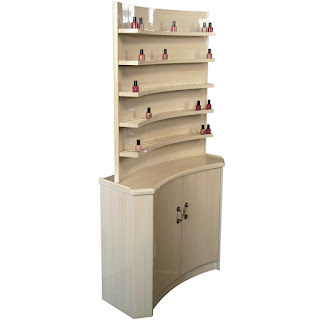 The Tung Nail Polish Stand is one of the most elegant nail polish displays I have seen! It is very appealing to the eye as well as highly functional. The design is perfect for creating a high end look and a VERY reasonable price. For only $456.00 per unit, this is the ideal display for any salon or spa looking for style and function. I think 2 of these units would look great in a salon. One could hold all the light pinks, neutrals and roses while the other displays reds and darker colors. Clients ENJOY choosing colors, a display like this makes it so inviting! I think this would work in just about any decor, but I would especially look great in space with a chandelier and a feel of elegance - or even a cozy, shabby chic boutique. PureSpaDirect.com is much more than a beauty supply! We have the largest online selection of polish racks, wholesale salon furniture, spa equipment and so much more. Let us help you find whatever you need to make your beauty business successful!